THE DEADLINE FOR PAPER SUBMISSION HAS BEEN EXTENDED UNTIL JANUARY 25, 2019. WIMS is a series of peer-reviewed International Computer Science conferences. It is a forum for researchers and practitioners to present their state-of-the-art results in building Intelligent Web, to examine performance characteristics of various approaches in Web-based intelligent information technology, and to cross-fertilize their ideas on the development of Web-based intelligent information management solutions across different domains. WIMS traditionally hosts a small number of short tutorials on the topics related to the scope of the conference series. The role of a WIMS tutorial is to be a theme-oriented comprehensive survey. WIMS also offers its infrastructure and facilities for the organizers of satellite workshops that complement the scope of the conference. The calls for WIMS’2019 Tutorials and Workshops are published separately. Companies or individuals interested in presenting their industrial products or methodologies are invited to contact the conference chairs. The best research paper as well as the best young research paper will be honored with a special prize. The best papers from the conference will be recommended for publication in special issues of internationally recognized journals. The authors of the best papers presented at WIMS’2019 may be invited to submit extended versions (more than 30% of new content) for possible publication in several international journals. More details on the nature of the different submission types can be found at the submission page. The papers in all the categories should describe original results that have not been accepted or submitted for publication elsewhere. All submissions will be evaluated by at least three members of the international program committee. Submissions should be made electronically in PDF or DOC/DOCX (MS/Open Word) format via the electronic submission system of the WIMS’2019 Conference Management system at WIMS’19 Easychair page. 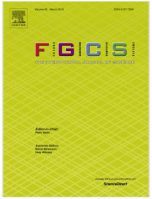 The submissions should be typeset using the templates of the ACM International Conference Proceedings Series (ICPS). The templates could be retrieved from the ACM website. 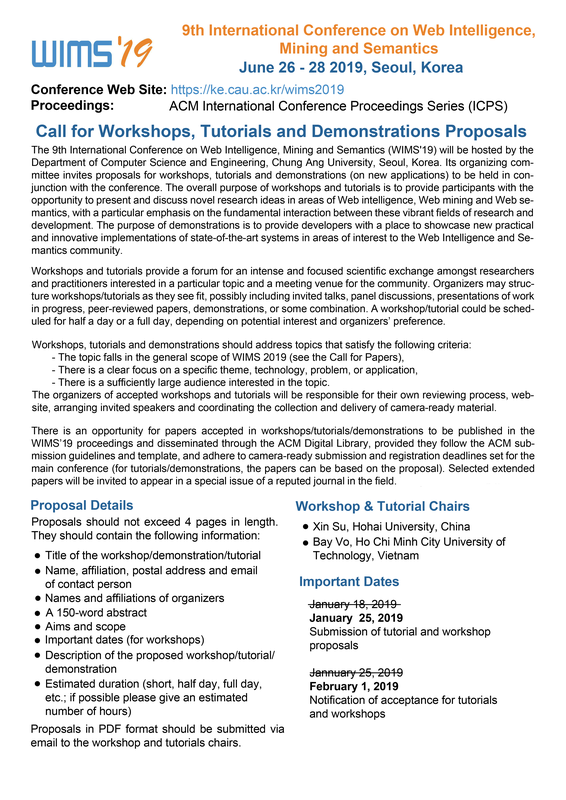 Accepted papers/tutorials/posters will be published by ACM and disseminated through the ACM Digital Library through the International Conference Proceedings Series (ICPS). A selection of the best WIMS’2019 papers will be invited to be revised and extended for the post-conference publication in special issues of internationally recognized journals. The camera-ready instructions and registration have now been updated! The accepted papers have now been announced! The deadline for paper submission has been extended until February 8, 2019 (firm deadline). 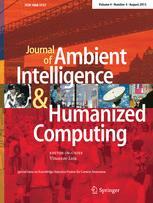 The authors of the best papers will be recommended to submit extended versions for possible publication in Future Generation Computer Systems (FGCS), Journal of Ambient Intelligence and Humanized Computing (JAIHC), and IEEE Access. Call for Paper (CFP) are avaliable. Conference leaflet is now available for download.